Lisa Buie-Collard - Author : St. Paddy's Day - Are You Green? St. Paddy's Day - Are You Green? May the “luck o’ the Oirish” be with you today and every day! Happy St. Patrick’s day! Are you wearing green? 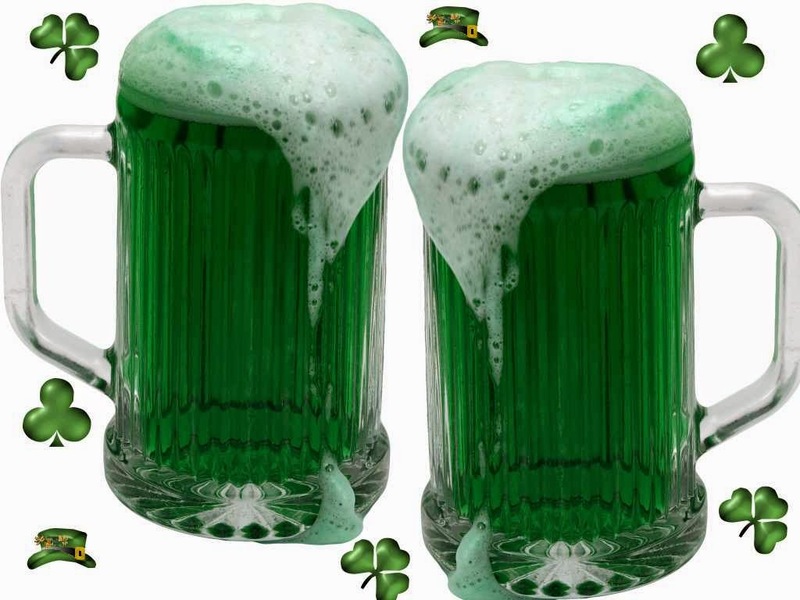 Do you participate in eating green foods or drinking green beer? What is our obsession with turning the day green in the US? Chicago even turns their river green at great cost with a “secret” recipe that supposedly doesn’t kill or pollute the fish. I wrote a short story about it once. But to move on, here is what I’ve done to celebrate St. Paddy’s Day! Couldn't wait for the actual day, so we tasted a bit, just to make sure it was good, right...! I made this cake in honor of two friends, Jo, who gave me the recipe, and “our” “local” Irishman Mark, who is moving to the mainland from Hawaii this week, and will also be heard on a radio broadcast for St. Paddy’s Day! Here is a link to Jo’s blog in case you want to try the recipe, and to Mark’s in case he’s able to put up a post for us to hear his lovely “Oirish” accent! Here is information about the Parade in Dublin, Ireland. I wish I could be there! In Indiana Leprechauns got loose to help raise awareness for cancer! Check this out for "Irish" recipes! I'd eat that green cake. My family is very green, and we celebrate by listening to Irish music and eating green scrambled eggs. They look a little odd, but taste good. Happy St. Patrick's Day! I assume the cake was OK as you didn't throw it out LOL. Good post today Lisa. I listened to Mark as well, great to hear the voice of a cyber friend. 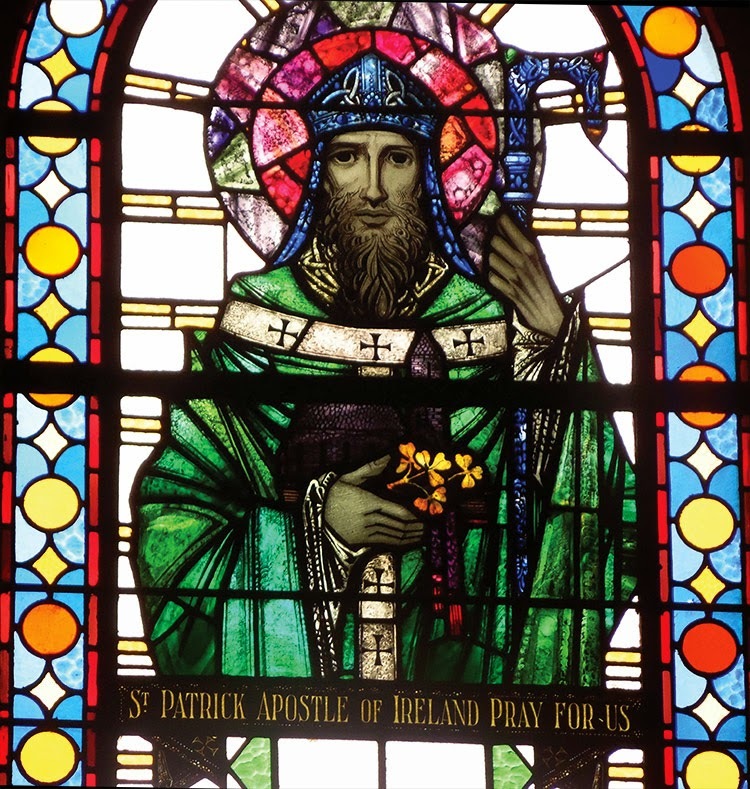 Happy St. Patrick's day to you. Oh, and send me a piece of cake. 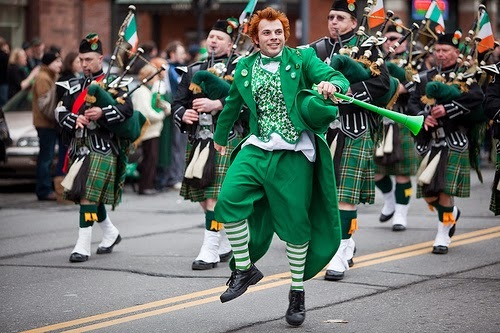 I used to be in a bagpipe-and-drum band in Chicago, and while we never marched in the big parade, we would spend most of St. Patrick's Day (and the weekend before) running around to various parties and other functions. The Chicago parade is a huge deal. It starts at noon, with the drinking starting a couple of hours before then. Every politician, ward heeler, labor union, TV and radio station, and a bunch of companies have floats in the parade. We were at the parade one year, and there were a bunch of guys from some company walking in it. One guy was carrying a flag, and all the guys with him were chanting, "He lost the float! He lost the float!" Hope you had a good time yesterday. Low key St. Pats day for us, but I did make Guinness stew. I kept forgetting it was St. Patty's day. We didn't do anything green, food or drink. But that cake looks delicious. I LOVE red velvet cake, and green is generally more my color than red, so (by transverse property),I LOVE green velvet cake! The green cake looks so yummy. I love the green river in Chicago. I'm not Irish , but my ex- husband (of 20 years) is from Chicago and there's no better place in the U.S., to spend St. Patrick's Day. I just stopped by to say hello before the 2015 A to Z challenge begins and to thank you for co-hosting such a fabulous and fun event . So much green. I lived in the suburb of Chicago for my first 23 years and some how never made it to see the green St. Patrick's Day river. Glad to see it here.